The former world number one is fined by the US Tennis Association after calling judge Carlos Ramos a "liar" and a "thief". Serena Williams has been fined more than £13,000 ($17,000) after receiving three code violations in the US Open. Williams lost her cool during the final on Saturday, launching a tirade against umpire Carlos Ramos after getting a warning for coaching from the stands early in the second set. She was penalised a second point for throwing her racket down in her anger and then a game after verbally abusing the umpire, calling him a "liar" and a "thief". The largest portion of Serena Williams's fine was the result of her row with Mr Ramos on Day Thirteen of the 2018 US Open at the USTA Billie Jean King National Tennis Center on September 8, 2018 in the Flushing neighborhood of the Queens borough of New York City. She was also fined for racket abuse But despite receiving support from across the tennis world, including from Billie Jean King, she was fined for the three violations by the US Tennis Association. She earned £1.43m ($1.85m) for reaching the tournament final. Naomi Osaka of Japan (R) hugs Serena Williams of the United States (L) after their match in the women's final on day thirteen of the 2018 U.S. Open tennis. Williams's arguments with the umpire cast a shadow over the final, which was opponent Naomi Osaka's first grand slam final and the first time a Japanese player has won a grand slam. "You're attacking my character," she said, as she demanded an apology. "You will never, ever be on another court of mine. You are the liar." 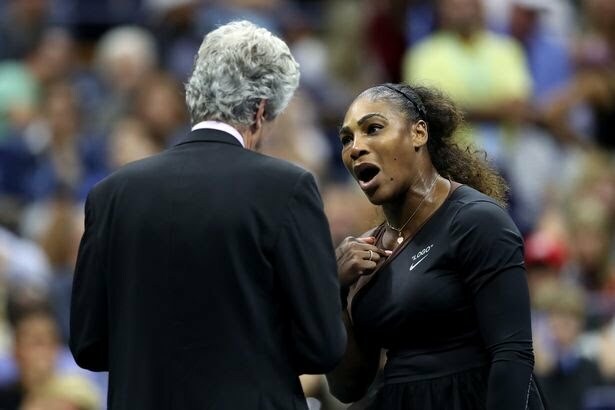 Her coach, Patrick Mouratoglou, later acknowledged the rule violation, but criticised the umpire for "creating drama", accusing him of screwing with a grand slam final. Serena Williams of the USA (right) cries while standing next to Naomi Osaka of Japan at the trophy presentation after the women’s final on day thirteen of the 2018 U.S. Open tennis tournament at USTA Billie Jean King National Tennis Center. 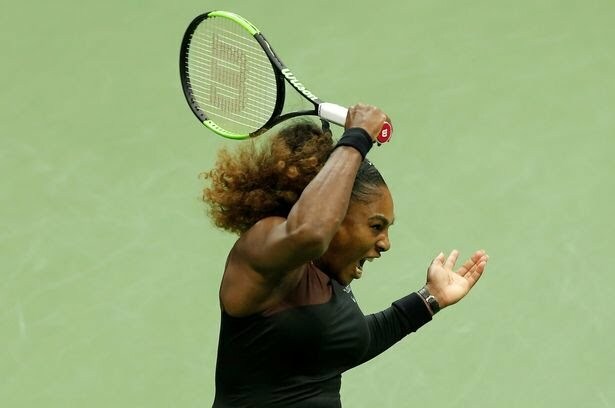 Serena Williams was tearful during the presentation In a news conference after the match, Williams, 36, said she was "fighting for women's rights" and for equality on the tennis court. She said: "I've seen other men call other umpires several things. I'm here fighting for women's rights and for women's equality and for all kinds of stuff. He's never taken a game from a man because they said 'thief'. "It blows my mind." Although she drew criticism, there were many who supported Williams, including Andy Roddick and Sue Barker. Williams smashed her racket on the court giving her a second violation . 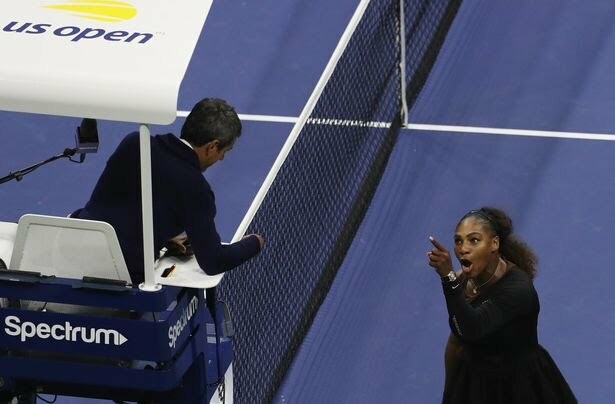 Barker said: "Serena in some ways has a point in the fact that I've sat courtside watching the men ranting at umpires and (they) haven't been given a violation. "Serena is saying the male players can say what they like to an umpire. Also, earlier in the tournament we saw Alize Cornet being given a code violation for changing her shirt on court. Then, in the same tournament, Mohamed Lahyani gets off the umpires' chair to talk to Nick Kyrgios and persuade him not to give up on a match. "So I think they have to look at the rules of what is allowed and what isn't, because I just think he was following the rules absolutely by the book, but sometimes the book has to be re-written - you can't have one rule for some players, and some umpires don't adhere to it and allow players to get away with things." The former French Open winner added that "tennis is the loser". King, who won 39 grand slam titles during her career, tweeted: "Several things went very wrong during the @usopen Women's Finals today. Coaching on every point should be allowed in tennis. It isn't, and as a result, a player was penalized for the actions of her coach. This should not happen. "When a woman is emotional, she's "hysterical" and she's penalized for it. When a man does the same, he's "outspoken" & and there are no repercussions. Victoria Azarenka also tweeted her support, saying she did not believe the same decisions would have been made in a men's match. Roddick tweeted it was the "worst refereeing" he had ever seen. The Women's Tennis Association said it will look into the dispute between the player and the chair judge.